China Energy Storage Market size was valued over USD 700 million in 2017 and cumulative capacity deployment is anticipated to exceed 4,000 MW by 2024. China energy storage (ES) market size will witness an appreciable growth driven by ongoing investments toward development of smart-grid infrastructure along with rapidly growing ancillary services industry. Growing adoption of energy storage systems aimed at enhancing grid stability in response to extensive penetration of intermittent renewable generation will further propel the industry growth. Declining technology costs along with increasing technical superiority of nascent technologies will stimulate China energy storage market size. The per unit cost of lithium batteries has reduced to half in the recent years from industry benchmarks and is set to continue to follow the price downturn. Furthermore, improving economies of scale in manufacturing coupled with reformative business scenario will augment the industry growth. Shifting focus toward decarbonization as an effort to curb the effects of global warming along with growing implementation of supportive legislative ventures will drive the China energy storage market growth. However, the effects of ongoing reduction in subsidy on renewables may reflect on the industry, but the hampered subsidy benefits may be leveled up by reducing technology prices for generation as well as storage. 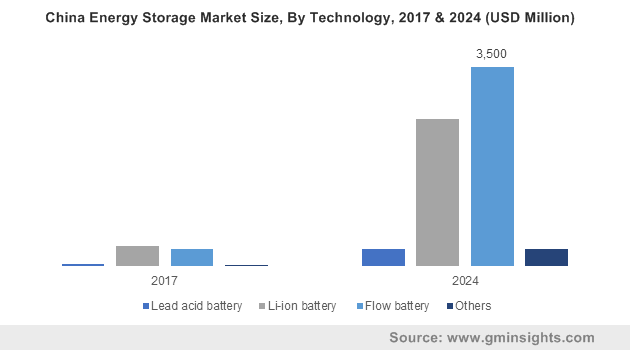 China lithium ion energy storage market will witness robust growth on account of ongoing reduction in battery costs primarily driven by improving economies of scale in battery manufacturing. High coulombic efficiency, high energy density, and low maintenance are some of the key features that will fuel the product deployment. China flow vanadium energy storage market size is anticipated to surpass USD 3 billion by 2024. Long scale duration, no self-discharge, rapid response time and ability to offer virtually unlimited storage capacity are the key features that make the technology more apt for renewable integration applications than other available counterparts. Additionally, vast vanadium reserves in the country implicates lower prices, ease of availability and minimal currency risks for the manufacturers, which will positively influence the business growth. China lead acid battery ES market will grow on account of the technology’s lower installation costs, technical maturity, long life, power handling performance, and robust construction. However, the use of hazardous materials including lead and sulphuric acid along with slow charge time are the major drawbacks of the technology that may hinder its deployment in coming years. China ancillary services energy storage market will expand exponentially owing to growing need for grid stability and resilience driven by continued replacement of conventional thermal power plants with renewable power generation technologies. Legislative reforms in favor of development of ancillary service industries most notably across the “Three North Region” of the country will further favor the industry landscape. China renewable integration energy storage market size is anticipated to expand over 30% by 2024. Ongoing investments toward renewable power generation favored by supportive government policies will drive the industry growth. Rising concerns over global warming in conjunction with ongoing efforts to limit carbon emissions will further propel the adoption of renewables which in turn will fuel the industry growth. 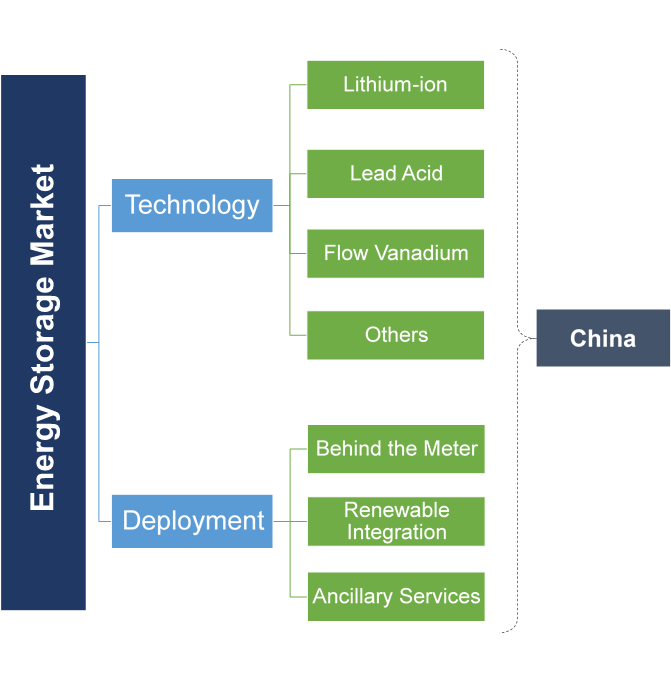 Major players operating across China energy storage market include CATL, Dynavolt, Eastar, Exide Technologies, Narada, ZTT, Shenzhen BAK Technology, Hoppecke, Panasonic Corporation, BYD, Hitachi Chemical, LG Chem, A123 Systems, CLOU Electronics, Sunwoda, Sacred Sun, Shoto, Sungrow and GS Yuasa amongst others. Prominent players active in the business are mainly focusing toward the development of innovative products and inorganic growth ventures as part of their strategy. In May 2018, Narada signed a contract with Zhongtian Iron & Steel Group toward installation of a 400MWh commercial energy storage power station project. The contract will help the company to penetrate large scale commercial energy storage industry. Electrical energy storage is the process to capture and store electrical energy, which can later be reconverted into electrical form as per requirement. The ability of energy storage systems to act as flexible generation and modulate energy demand will fuel their adoption. The technology is increasingly gaining utilization across renewable power generation, transmission & distribution systems and ancillary services across the power sector.